If a "Ninja" monster is Summoned to your field: You can target 1 "Ninja" monster or 1 "Ninjitsu Art" card in your GY; add it to your hand, but you cannot activate cards, or the effects of cards, with that name for the rest of this turn. 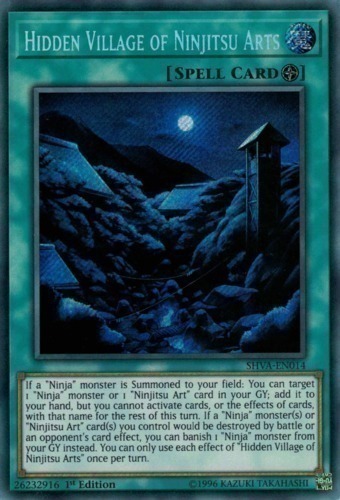 If a "Ninja" monster(s) or "Ninjitsu Art" card(s) you control would be destroyed by battle or an opponent's card effect, you can banish 1 "Ninja" monster from your GY instead. You can only use each effect of "Hidden Village of Ninjitsu Arts" once per turn.